Let’s face it – straws are way cooler to drink from when they’ve got something fun sitting on top of them. That’s why we’ve decided to round-up 30 of the most marvelous straw toppers to share with you today. It’s the largest (and only) DIY straw topper collection on the internet! Whether you’re celebrating Halloween, Christmas, Easter, a graduation, or simply summer – there’s a crafty straw topper here to suit every person or occasion. It’s time to dust off those straws and pour yourself a nice drink as we dive into the 30 tutorials below! 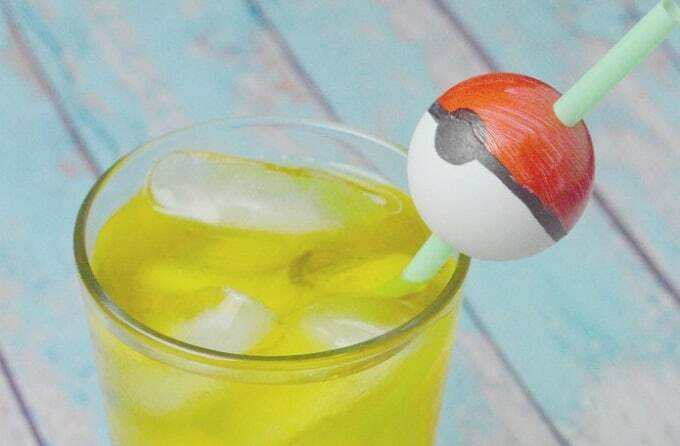 While the Pokemon craze is sweeping the world yet again, why not celebrate it by making these DIY pokeball straw toppers by 4 the Love of Family? They’re so easy to create! Here’s one way to add an extra summery touch to your drinks – by creating these DIY straw toppers from A Joyful Riot! These can be printed for free from the blog, then all you need to do is assemble them. Donut straw umbrellas…need we say more? A Joyful Riot has provided you with some more fun printables for free – how generous is she?! Every child will love creating these octopus straw toppers from Blitsy, not to mention drinking with them! They’re fun and colorful. It’s just not a celebration without these fancy DIY straw toppers from Dawn Nicole Designs! They’re perfect for accompanying your champagne. Halloween is just around the corner, so what better way to celebrate than with these DIY bat straw toppers from Delia Creates? She’ll show you everything you need to know to create them. Again, these straw toppers are perfect for Halloween! Delia Creates sure does know her crafty stuff, so be sure to check out the full tutorial. Want some more DIY Halloween goodness, this time from Design, Eat, Repeat? We adore these ghostly straws! These DIY gold bow straws look gorgeous; don’t you think? Destination Nursery is the genius behind this beautiful design. These adorable DIY bunny tail straw toppers are just what you need for Easter! They can even be used for a kids’ bunny party too – find out more via Dukes and Duchesses. The Etsy blog has shared this brilliant tutorial to help you create these DIY moustache straw toppers – so cool! What occasion will you use yours for? It just wouldn’t be a DIY straw topper roundup without showcasing some Christmas-themed ones. Fireflies and Mud Pies has made these fun designs. Here’s another simple but fun DIY straw topper that you can make for Halloween! Ginger Snap Crafts will show you how to create your own spider versions. Eek – we love this DIY donut straw topper from Let’s Mingle Blog! It’s both cute and crafty, so be sure to check out the full tutorial. Dogs eating ice cream? Love it! Lia Griffith created these DIY straw toppers for an ice cream party and has been generous enough to share the free printables with you. Wow, how pretty is this DIY peony straw topper from Made to be a Momma? You’ll find the full tutorial and printable version over on the blog. If you’re thinking of throwing an underwater themed party anytime soon, then these DIY sea inspired straw toppers from Make and Tell will be right up your alley. We love the seahorse one in particular! These colorful sleeping pumpkins are adorable! The fact that they come in printable straw toppers is even more amazing – thanks Make and Tell! Martha Stewart has created these DIY shamrock straw toppers and they’re perfect for celebrating St. Patrick’s Day – don’t you think? The tutorial will teach you the step-by-step method too. Here’s a Valentine’s Day craft that won’t break the bank (or take up too much time!). Mom Dot has created these heart straw toppers and it’s safe to say that we’re in love with them. It’s just not a summer party without these fun diving women straw toppers. Oh Happy Day is the clever blogger behind this fantastic idea! Encourage the kiddies to eat healthily (well, sort of) by getting them to make these simple carrot straw toppers from Optimistic Mommy. They’ll love drinking from the colorful and crafty design! Who doesn’t love Dory and Nemo? Embrace the popular movie by creating these DIY straw toppers from Raising Whasians. Turn your drinking straws into bohemian-inspired arrows by following this DIY straw topper tutorial from Squirelly Minds! You can use any color that your heart desires. If you fancy making your straw toppers more personal for your party guests, then this DIY tutorial from Studio DIY is perfect for you. She has made watercolor monograms – amazing! These cute pineapples can easily be made into DIY straw toppers, just as Sugar and Charm has done. They’re sure to liven up any summer themed party! Add some more paper fun to your paper straws by creating these DIY paper flower straw toppers from The 36th Avenue! We think they’re super pretty. Could these mini piñata straw toppers be any cuter – or cleverer? We think not! The Glitter in my Tea will show you everything you need to know in order to create them yourself (includes free templates). Here’s one way to celebrate graduation – with these amazing DIY academic cap straw toppers from The Glitter in my Tea! They’re even too good to throw away once you’ve finished with them. Our round-up wouldn’t be complete without some flamingos thrown in for good measure! The TomKat Studio has created these quite easily, so you won’t want to miss the full tutorial. There you have it – 30 fun DIY straw toppers to help you celebrate any occasion! Which ones were your favorites? We’d love to hear from you in the comments section below!